IEEE EDOC 2018 is the twenty-second conference in a series that provides the key forum for researchers and practitioners in the field of enterprise computing. EDOC conferences address the full range of models, methodologies, and engineering technologies contributing to intra- and inter-enterprise application systems. Since 1997, EDOC has brought together leading computer scientists, IT decision makers, enterprise architects, solution designers, and practitioners to discuss enterprise computing challenges, models and solutions from the perspectives of academia, industry, and government. The EDOC conference series emphasizes a holistic view on enterprise applications engineering and management, fostering integrated approaches that address and relate business models, business processes, people and technology. EDOC 2018 will take place in Stockholm, Sweden, from October 16th to October 19th, 2018. 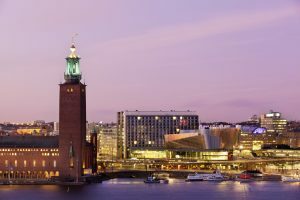 The host institution for EDOC 2018 is the School of Electrical Engineering and Computer Science at KTH Royal Institute of Technology, Sweden. Please subscribe here to receive updates from the conference and future EDOC events. IEEE EDOC is the no 1 enterprise conference (on e.g. enterprise computing, enterprise architecture, enterprise engineering) according to Google Scholar’s h5-index. Watch a teaser video of KTH, and come back soon for more details!